This is a recreation/improvement on a salad I bought from Dean & Deluca last week. This version is eeeeeerrrrything I wanted that version to be – and then some (so good, in fact, that I got distracted while tasting it and putting my rings back on the wrong hands). The D&D version was good – but not Hannibal Lecter good (lost? explanation coming). Fine to smash at 9pm while waiting for the Ferry, but not what one would unpack ceremoniously from a fine box while going someplace. I remember the first time I saw Silence Of The Lambs – the movie was great and all, but what *really* struck my little food nerd of a preteen heart was the end scene where Hannibal Lecter unpacks a Dean & Deluca picnic spread with great relish while on a plane. That spread (minus the brains, of course) set some life goals in place immediately (namely to shop there, live in NYC so I can shop there at will, and get one of those picnic packs). I also mailed away for a subscription to their quarterly catalog and kept that subscription going until I went away to college. Never ordered anything, but I drooled and dreamed. While I’ve achieved two of those goals, I’m sad to say I have not gotten a picnic pack – mostly because while I love Dean & Deluca in theory, in practice most of the freshly made food I’ve gotten from D&D isn’t as amazing as I want it to be – and I’m not spending a Quintilian dollars on plane snacks when I can make my own. Possibly also because preteen me’s love of fancy packaging and tiny food is a tall order to live up to, and those packs always feature a bunch of stuff I’m not excited about – like gummy bears and other candy. Note to self: make my own tin-based travel pack packed with stuff I *do* like. To make: Roast the Brussels. While roasting, assemble the dressing. Put two of your eggs in a small pot and cover with a couple inches water. When the water is boiling, lower a third egg down in a ladle so it is covered by the water but you still have a hold of it. Boil 1 minute and remove, immediately running under cold water or dunking into an ice bath. Let your other eggs go until you whisk the dressing, cover the pot and kill the heat, let sit until you’re done with the rest of the salad. Crush the garlic in a mortar and pestle; add to a large bowl. Mince the anchovy and add. Add the coddled egg, Worcestershire, citrus juice, salt, a bunch of pepper, olive oil, and vinegar. Whisk to combine. When the Brussels are finished browning and have cooled until mostly not hot, add to the bowl with the dressing. Add the kale and almonds; massage to combine thoroughly. Peel the 2 hard boiled eggs and chop. Fold in gently. 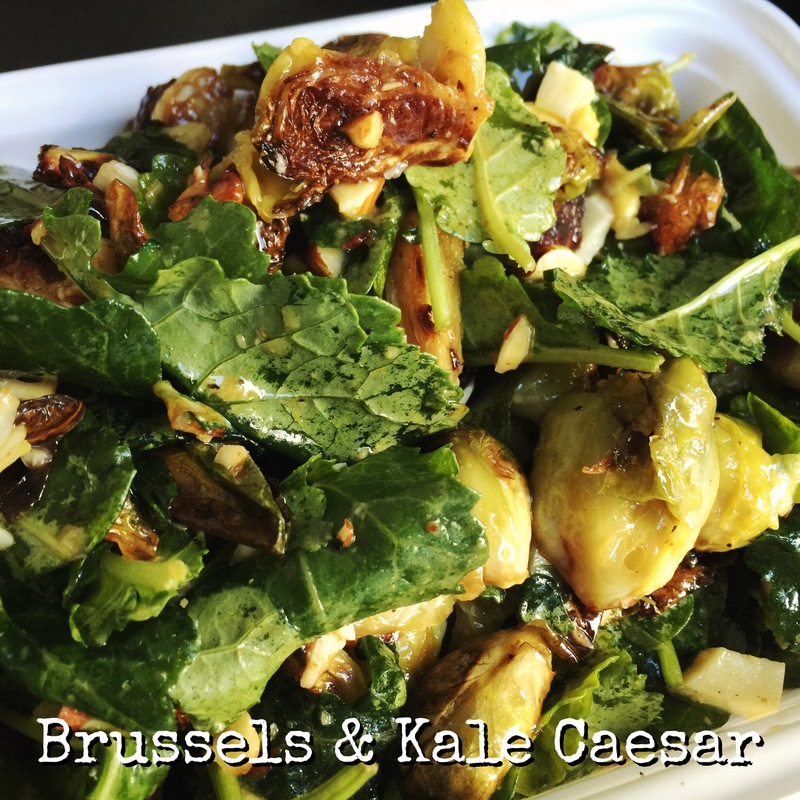 Brussels and kale is such a great combination. This salad is really great – a one-two green veg punch!